Below is an extract from the SSU UK Members Handbook. For more detailed information on the importance of Kata see your handbook. The true meaning and spirit of Karate-do are embedded in the Kata, and only by the constant practice of Kata can we come to understand them. The primary purpose of kata is to teach one how to fight. Deciphering the kata is Bunkai, which enables the student to take moves out of the kata, interpret them and use them as a fighting technique. Often these techniques are not obvious and require thorough analysis, which makes practicing bunkai crucial to one's training in Karate. Okinawa Island (沖縄本島) is the largest of the Okinawan Islands and the Ryukyu Islands of Japan. Naha (那覇市) is the capital city of Okinawa, the most southern prefecture of Japan. Shuri (首里) is a district of the city of Naha, Okinawa. It was formerly a separate city in and of itself, and the royal capital of the Ryūkyū Kingdom. 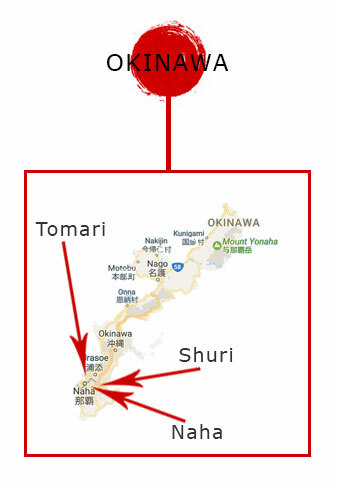 Tomari (泊) is a neighbourhood in Naha, Okinawa Prefecture, Japan, where the Tomari Terminal of the port of Naha is located.